Sara Von Kienegger and Art of Elysium host Los Angeles -based MAMA's presentation of Ryan Heffington's "Wading Games." Visuals by Osk and music by BANKS. At the Ritz Carlton, South Beach, on December 4, 2014, in Miami Beach, Florida. (Photo by Aaron Davidson/Getty Images for Sara Von Kienegger). 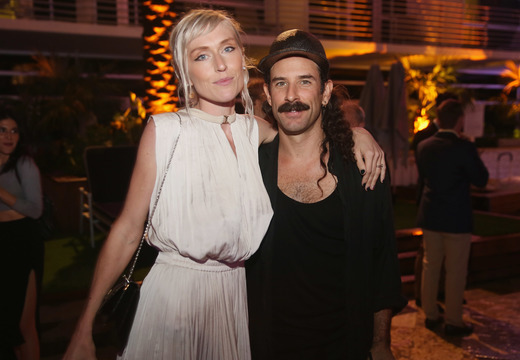 Thursday night, December 4th, in Miami Beach was a busy evening, jam-packed with events, openings, performances, and parties all over South Beach. Art professionals and enthusiasts from all over the country had flocked for the week to mingle, schmooze, and take in the art and the scene. The night kicked off with a compelling and powerful performance choreographed by Los Angeles-based Ryan Heffington in collaboration with Los Angeles’s MAMA gallery. Heffington’s dancers took center stage in the outdoor area of the Ritz Carlton hotel in a performance titled Wading Games that presented a blonde female dancer in an iridescent, flapper-inspired dress that exaggerated her dramatic and commanding movements as she passed from male to male dancer along a row as they dropped to the ground in her wake. Sara Von Kienegger and Art of Elysium host Los Angeles -based MAMA’s presentation of Ryan Heffington’s “Wading Games.” Visuals by Osk and music by BANKS. At the Ritz Carlton, South Beach, on December 4, 2014, in Miami Beach, Florida. (Photo by Aaron Davidson/Getty Images for Sara Von Kienegger). As the performance continued, the roles and powers of the dancers exchanged. Suddenly the position of the female dancer was subverted as she rolled in poetic, spiraling motions from one male dancer to the other, her dramatic red hair and the glittering, silver strips of her dress flipping in all directions around her. The backdrop for Wading Games was a large video projection by OSK, featuring close-up images of a woman’s face, the creases in her lips, the pigment in her cheeks at times filling the entire screen as the flinging bodies collided and separated over and over again in the foreground. The tenderness and vulnerability projected in the video accompanying the dance stood in contrast to the contentious nature of the brash movements of Heffington’s dancers throughout the performance. This performance marks the beginning of future projects at MAMA with Heffington who will also be presenting another version of Wading Games at their L.A. space later in December as part of a group exhibition with a diverse roster of artists and musicians including Lola Rose Thompson, David Sigmund, Cole Sternberg, and others. Adarsha Benjamin and Ryan Heffington.